I have been wanting to share what we do here and the profound affect it has been having on our clients lives. The most difficult part of my job is to attempt to explain to others something that is meant to be felt. I cannot tell you the number of times I have scheduled a tour for a prospective Horsemanship client and half-way through their eyes are brimming with emotion. Due to the nature of this work, it is very personal and sometimes painful, so protecting the privacy of our clients is of utmost importance. I have asked a few clients for permission to share their thoughts and likenesses on our blog, to help others understand the incredible power of working with an equine teacher and skilled facilitator/therapist that is available here at Horse Haven. Not everyone has a traumatic past or life challenging circumstances, but everyone can benefit from working with the horses…if only to step away from their busy lives, take a deep breath, and experience being present in the moment! We have recently had the great good fortune to come in contact with Mikkel Becker, a professional dog trainer, freelance writer, published author and horse enthusiast. 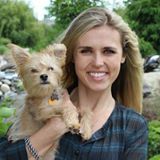 She is also the daughter of Marty Becker dubbed America’s Veterinarian who has written several books, including The Healing Power of Pets. Mikkel is also passionate about the amazing ability animals have to assist people in overcoming lifes obstacles and fears and has worked with dogs and at risk youth. Mikkel has graciously agreed to enter our program and to journal about her experience with us and the horses. We hope you enjoy it!